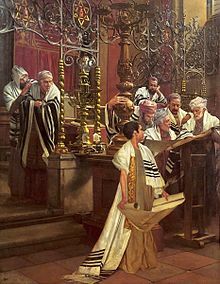 Bar Mitzvah (Hebrew: בַּר מִצְוָה) is a Jewish coming of age ritual for boys. Bat Mitzvah (Hebrew: בַּת מִצְוָה; Ashkenazi pronunciation: Bas Mitzveh) is a Jewish coming of age ritual for girls. The plural is B'nai Mitzvah for boys, and B'not Mitzvah (Ashkenazi pronunciation: B'nos Mitzvah) for girls. Bar-Mitzvah ceremony at a Reform synagogue. According to Jewish law, when Jewish boys become 13 years old, they become accountable for their actions and become a bar mitzvah. A girl becomes a bat mitzvah at the age of 12 according to Orthodox and Conservative Jews, and at the age of 13 according to Reform Jews. Prior to reaching bar mitzvah age, the child's parents hold the responsibility for the child's actions. After this age, the boys and girls bear their own responsibility for Jewish ritual law, tradition, and ethics, and are able to participate in all areas of Jewish community life. Traditionally, the father of the bar mitzvah gives thanks to God that he is no longer punished for the child's sins. In addition to being considered accountable for their actions from a religious perspective, a thirteen-year-old male may be counted towards a prayer quorum and may lead prayer and other religious services in the family and the community. Bar mitzvah is mentioned in the Mishnah (Ethics of the Fathers, 5:21) and in the Talmud. In some classic sources the age of 13 appears for instance as the age from which males must fast on the Day of Atonement, while females fast from the age of 12. The age of b'nai mitzvah roughly coincides with physical puberty. The bar or bat mitzvah ceremony is usually held on the first Shabbat after a boy's thirteenth and a girl's twelfth birthday (or thirteenth in Reform congregations). Bar (בַּר) is a Jewish Babylonian Aramaic word meaning "son" (בֵּן), while bat (בַּת) means "daughter" in Hebrew, and mitzvah (מִצְוָה) means "commandment" or "law" (plural: mitzvot). Thus bar mitzvah and bat mitzvah literally translate to "son of commandment" and "daughter of commandment". However, in rabbinical usage, the word bar means "under the category of" or "subject to". Bar mitzvah therefore translates to "an [agent] who is subject to the law". Although the term is commonly used to refer to the ritual itself, in fact the phrase originally refers to the person. The modern method of celebrating becoming a bar mitzvah did not exist in the time of the Hebrew Bible, Mishnah or Talmud. Early rabbinic sources specify 13 as the age at which a boy becomes a legal adult. However, the celebration of this occasion is not mentioned until the Middle Ages. The Bible does not explicitly specify the age thirteen. Passages in the books of Exodus and Numbers note the age of majority for army service as twenty. Machzor Vitri notes that Genesis 34:25 refers to Levi as a "man", when a calculation from other verses suggests that Levi was aged thirteen at the time. The age of thirteen is mentioned in the Mishnah as the time one is obligated to observe the Torah's commandments: "At five years old one should study the Scriptures, at ten years for the Mishnah, at 13 for the commandments..."
"Why is the evil inclination personified as the great king (Ecclesiastes 9:14)? Because it is thirteen years older than the good inclination." That is to say, one's good inclination begins to act upon reaching the age of majority. According to Pirke Rabbi Eli'ezer 26, Abraham rejected the idolatry of his father and became a worshiper of God when he was thirteen years old. The term "bar mitzvah" appears first in the Talmud, meaning "one who is subject to the law", though it does not refer to age. The term "bar mitzvah", in reference to age, cannot be clearly traced earlier than the 14th century, the older rabbinical term being "gadol" (adult) or "bar 'onshin" (one legally responsible for own misdoings). Many sources indicate that the ceremonial observation of a bar mitzvah developed in the Middle Ages. Simon Tzemach Duran quotes a Midrash interpreting the Hebrew word zo ("this") in Isaiah 43:21 ("This people have I formed for myself, they shall speak my praise") as referring by its numerical value to those that have reached the age of 13. This seems to imply that, at the time of the composition of the Midrash the bar mitzvah publicly pronounced a benediction on the occasion of his entrance upon maturity. The Midrash Hashkem: "The heathen when he begets a son consecrates him to idolatrous practises; the Israelite has his son circumcised and the rite of 'pidyon haben' performed; and as soon as he becomes of age he brings him into the synagogue and school in order that he may praise the name of God, reciting the 'Barekhu' (Benediction) preceding the reading from the Law." Masseket Soferim (18:5) makes matters even more explicit: "In Jerusalem they are accustomed to initiate their children to fast on the Day of Atonement, a year or two before their maturity; and then, when the age has arrived, to bring the Bar Mitzvah before the priest or elder for blessing, encouragement, and prayer, that he may be granted a portion in the Law and in the doing of good works. Whosoever is of superiority in the town is expected to pray for him as he bows down to him to receive his blessing." Genesis Rabbah, commenting upon Genesis 25:27, says: "Up to thirteen years Esau and Jacob went together to the primary school and back home; after the thirteen years were over, the one went to the beit midrash to study Law, the other to the house of idols. Regarding this, Rabbi Eleazar remarks, 'Until the thirteenth year it is the father's duty to train his boy; after this he must say: "Blessed be He who has taken from me the responsibility [the punishment] for this boy!"" "It is a mitzvah for a person to make a meal on the day his son becomes Bar Mitzvah as on the day he enters the wedding canopy." Reaching the age of bar or bat Mitzvah signifies becoming a full-fledged member of the Jewish community with the responsibilities that come with it. These include moral responsibility for one's own actions; eligibility to be called to read from the Torah and lead or participate in a minyan; the right to possess personal property and to be legally married according to Jewish law; the duty to follow the 613 laws of the Torah and keep the halakha; and the capacity to testify as a witness in a Beth Din (Rabbinical court) case. Many congregations require pre–bar mitzvah children to attend a minimum number of Shabbat prayer services at the synagogue, study at a Hebrew school, take on a charity or community service project, and maintain membership in good standing with the synagogue. In addition to study and preparation offered through the synagogue and Hebrew schools, bar mitzvah tutors may be hired to prepare the child through the study of Hebrew, Torah cantillation and basic Jewish concepts. In 2012, concern about the high post-bar/bat mitzvah drop out rate led the Union for Reform Judaism to launch the B'nai Mitzvah Revolution, an effort to shift Reform congregations away from "the long-held assumption that religious school is about preparing kids for their bar/bat mitzvah" and focus instead on teaching them how to become committed and involved members of the Jewish community. The widespread practice is that on a Sabbath shortly after he has attained the age of thirteen, a boy is called up to read from the weekly portion of the Law (Torah), either as one of the first seven men or as the last, in which case he will read the closing verses and the Haftarah (selections from the books of the Prophets); and if he is unable to read, to recite at least the benediction before and after the reading. He may also give a d'var Torah (a discussion of some Torah issue, such as a discussion of that week's Torah portion) and/or lead part or all of the prayer services. In Orthodox circles, the occasion is sometimes celebrated during a weekday service that includes reading from the Torah, such as a Monday or Thursday morning service. The obligation to lay tefillin begins when a boy reaches bar mitzvah age. The common custom is for the bar mitzvah boy to begin putting on tefillin one to three months before his bar mitzvah. This way, by the time he is obligated in the commandment, he will already know how to fulfill it properly. The first mention of a party associated with a synagogue bar mitzvah was in the 13th century, so throwing some sort of party is traditional and frequently seen as necessary. In some times and places, local Jewish leaders have formally limited the size and elaborateness of mitzvahs. For example, only ten men were permitted to attend the party in 1730 in Berlin, and music was banned at these parties in 1767 in Prague. These rules were usually meant to avoid offending non-Jewish neighbors, and to maintain the rule that it was a smaller celebration than a wedding. Bar and bat mitzvah parties in America are often lavish affairs held at hotels and country clubs with hundreds of guests. The trend has been mocked, most notably in the movie Keeping Up with the Steins. In the 1950s, Rabbi Harold Saperstein of New York described them as too often being "more bar than mitzvah". Rabbi Shmuley Boteach says that over-the-top bar mitzvah parties were already common when he was growing up in Miami in the 1970s. In 1979, the Responsa Committee of the Central Conference of American Rabbis addressed the Reform attitude toward bar/bat mitzvah: "Every effort should be exerted to maintain the family festivities in the religious mood at the bar/bat mitzvah. Some of the efforts of early Reform in favor of confirmation against bar mitzvah were prompted by the extravagant celebration of bar mitzvah, which had removed its primary religious significance. We vigorously oppose such excesses, as they destroy the meaning of bar/bat mitzvah." In May, 1992, the board of trustees of the Union of American Hebrew Congregations (now the Union for Reform Judaism), the synagogue arm of the Reform Movement, unanimously passed a resolution decrying "excesses of wasteful consumption...glitzy theme events, sophisticated entertainment...and expensive party favors", calling instead for "family cohesion, authentic friendship, acts of tzedakah (righteous giving), and parties suitable for children." The cost of the party depends upon what the family is willing and able to spend. Some very wealthy families spend tens, or even hundreds, of thousands of dollars on the party. Generally speaking, these celebrations are not quite as expensive or as elaborate as a wedding in that family. In addition to food and drink for the guests, the money at an elaborate party is mostly spent on renting and decorating a venue and hiring workers, from the catering staff to emcees, DJs, entertainers and dancers (also called "motivators") to encourage the guests to dance or play games. Today many non-Orthodox Jews celebrate a girl's bat mitzvah in the same way as a boy's bar mitzvah. All Reform and Reconstructionist, and most Conservative synagogues have egalitarian participation, in which women read from the Torah and lead services. In Orthodox communities, a Bat Mitzvah is celebrated when a girl reaches the age of 12. The majority of Orthodox and some Conservative Jews reject the idea that a woman can publicly read from the Torah or lead prayer services whenever there is a minyan (quorum of 10 males) available to do so. However, the public celebration of a girl becoming bat mitzvah in other ways has made strong inroads into Modern Orthodox Judaism and also into some elements of Haredi Judaism. In these congregations, women do not read from the Torah or lead prayer services, but they occasionally lecture on a Jewish topic to mark their coming of age, learn a book of Tanakh, recite verses from the Book of Esther or the Book of Psalms, or say prayers from the siddur. In some Modern Orthodox circles, bat mitzvah girls will read from the Torah and lead prayer services in a women's tefillah. Rabbi Moshe Feinstein, a prominent Orthodox posek, has ruled that bat mitzvah celebrations are permissible, but should not be held in a synagogue, because then they would be construed as imitating Reform and Conservative customs; in any case, they do not have the status of seudat mitzvah. Rabbi Ovadiah Yosef holds that it is a seudat mitzvah. According to the archivist at the Great Synagogue in Rome, the custom of a young woman being called up in synagogue before the entire community dates back to the early years of the Roman Jewish community approximately 2,300 years ago. The community recognized her as "being of age" and acknowledged her in a public fashion. This would support more modern documents that record an Orthodox Jewish Italian rite for becoming bat mitzvah (which involved an "entrance into the minyan" ceremony, in which boys of thirteen and girls of twelve recited a blessing) since the mid-19th century. There were also bat mitzvah rituals held in the 19th century in Iraq. All this may have influenced the American rabbi Mordecai M. Kaplan, who held the first public celebration of a bat mitzvah in the United States, for his daughter Judith, on March 18, 1922, at the Society for the Advancement of Judaism, his synagogue in New York City. Judith Kaplan recited the preliminary blessing, read a portion of that week's Torah portion in Hebrew and English, and then intoned the closing blessing. Kaplan, who at that time claimed to be an Orthodox rabbi, joined Conservative Judaism and then became the founder of Reconstructionist Judaism, influenced Jews from all branches of non-Orthodox Judaism, through his position at the Jewish Theological Seminary of America. At the time, most Orthodox rabbis strongly rejected the idea of a bat mitzvah ceremony. The kibbutz movement in Israel also encouraged the celebration of the bar mitzvah. All those coming of age in the community for that year would take on a project and research in a topic of Jewish or Zionist interest. Today many kibbutz children are opting for a more traditional bar mitzvah celebration. Among some Jews, a man who has reached the age of 83 will celebrate a second bar mitzvah, under the logic that in the Torah it says that a normal lifespan is 70 years, so that an 83-year-old can be considered 13 in a second lifetime. This ritual is becoming more common as people live longer, healthier lives. A Bark Mitzvah is a pseudo-traditional observance and celebration of a dog's coming of age, as in the Jewish traditional bar mitzvah and bat mitzvah. The term has been in use since at least as early as 1997, and Bark Mitzvahs are sometimes held as an adjunct to the festival of Purim. Bar or bat mitzvah celebrations have become an occasion to give the celebrant a commemorative gift. Traditionally, common gifts include books with religious or educational value, religious items, writing implements, savings bonds (to be used for the child's college education), gift certificates, or money. Gifts of cash have become commonplace in recent times.[when?] As with charity and all other gifts, it has become common to give in multiples of 18, since the gematria, or numerical equivalent of the Hebrew word for "life", ("chai"), is the number 18. Monetary gifts in multiples of 18 are considered to be particularly auspicious and have become very common for the bar and bat mitzvah. Many b'nai mitzvah also receive their first tallit from their parents to be used for the occasion and tefillin where this is appropriate. Jewelry is a common gift for girls at a bat mitzvah celebration. Another gift for the bat mitzvah girl are Shabbat candlesticks because it is the duty and honour of the woman to light the candles. While the traditional age to hold a Bar or Bat mitzvah is 13 for boys and 12 or 13 for girls, some adults choose to have a Bar or Bat Mitzvah if they did not have them as children. Since the 1970s, adult bar and bat mitzvah have been growing in popularity. Bar/Bat Barakah means, in Aramaic, "Son/Daughter of the Blessing". In honour and recognition of Jewish traditions, including Zeved habat and Bar and Bat Mitzvah, some Christians have begun to conduct a Bar and Bat Barakah ceremony to pronounce blessings upon their children. ^ "Origins of the Bar/Bat Mitzvah". ReformJudaism.org. 19 October 2012. ^ Bazelon, Emily (May 19, 2005). "Saving the Bar Mitzvah". Slate. Archived from the original on October 13, 2007. Retrieved 2007-10-05. ^ Machzor Vitri on Pirkei Avot, also found at Machzor Vitry מחזור ויטרי (in Hebrew). p. 549. Retrieved Mar 7, 2018. ^ a b Olitsky, Kerry M. An Encyclopedia of American Synagogue Ritual, Greenwood Press, 2000. ISBN 0-313-30814-4 p. 7. Marcus Jastrow; Kaufmann Kohler (1901–1906). "Bar Miẓwah". In Singer, Isidore; et al. The Jewish Encyclopedia. New York: Funk & Wagnalls. ^ "History of the Bar Mizvah". Jewish Encyclopedia. Retrieved 2013-04-13. ^ Washofsky, Mark (2001). Jewish Living: A Guide to Contemporary Reform Practice. UAHC Press. ISBN 978-0-8074-0702-8. ^ a b c Reform Judaism magazine, Winter 2012. ^ Calling someone up to say the Torah blessings during a service is called an Aliyah, from the Hebrew: עֲלִיָּה, from the verb la'alot, לעלות, meaning, "to rise, to ascend; to go up"
^ "Some Laws of Tefillin – The Basic Laws and the order of Putting on the Tefillin". Chabad.org. Retrieved 2012-08-13. ^ a b c d e f g h Doll, Jen (9 December 2017). "The Bar Mitzvah Party Starters". Topic. Retrieved 2017-12-23. ^ Cohen, Stefanie (April 18, 2010). "$1 Million Parties – Have NYC Bar Mitzvahs Gone Too Far?". New York Post. Archived from the original on April 20, 2010. Retrieved 2010-04-18. ^ Al (2011-01-18). "Saturday Night Live Mocks Over-The-Top Bar Mitzvah". Jewish Humor Central. Retrieved 2012-08-13. ^ Allison Hoffman (December 9, 2007). "Big bucks and pink thrones". The Chicago Jewish News. Archived from the original on November 20, 2012. Retrieved 2012-08-13. ^ Rabbi Shmuley Boteach (August 23, 2010). "Extravagant Weddings and Bar Mitzvahs Humiliate the Jewish Community". The Huffington Post. ^ Marcus, Ivan G. (2004). The Jewish Life Cycle: Rites of Passage from Biblical to Modern Times. Seattle and London: University of Washington Press. ISBN 0-295-98440-6, p. 105. ^ Barkat, Amiram (2003-05-27). "Coming of age a little later than usual". Haaretz. Retrieved 2013-04-13. ^ a b "The First American Bat Mitvah". Jewish Virtual Library. 1922-03-18. Retrieved 2013-04-13. ^ Waskow, Arthur Ocean and Phyllis Ocean Berman. Excerpt from A Time for Every Purpose Under Heaven Farrar, Straus and Giroux, LLC at "History of Bat Mizvah". Archived from the original on October 13, 2007. Retrieved 2007-10-10. ^ Maag, Christopher (March 22, 2009). "Having a Bat Mitzvah in Their 90s Because It's a Hoot". The New York Times. Retrieved March 31, 2010. ^ Arking, Linda (June 1, 2000). "Molly's Unforgettable Bat Mitzvah". Sh'ma, A Journal of Jewish Ideas. Retrieved August 15, 2011. ^ "Bar/Bat Mitzvah Program". City Congregation for Humanistic Judaism. Archived from the original on April 20, 2008. ^ Carolyn Slutsky (July 15, 2009). "At This Bar Mitzvah, Dylan's The Only Prophet". The Jewish Week. New York. Archived from the original on July 20, 2009. ^ "LifeCycle Events: Bar and Bat Mitzvah". ^ Amy Oringel (October 19, 2017). "Why 83 Is The New 13 For Bar Mitzvahs". Forward.com. Retrieved January 31, 2018. ^ Lily Koppel (December 20, 2004). "Today He Is a Dog; Actually He Always Was". The New York Times. ^ Shari Cohen and Marcelo Gindlin. Alfie's Bark Mitzvah. Chandler, Arizona: Five Star Publications, 2007. Book with audio CD. ISBN 1-58985-055-6, 978-1589850552. ^ Rabbi Charles A. Kroloff (January 19, 1997). "A Rabbi's View Of a 'Bark Mitzvah'". The New York Times. ^ Maryann Mott (October 6, 2006). "Pets Gaining Recognition in Places of Worship". National Geographic News. 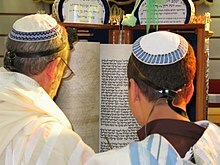 ^ "Judaism 101: Bar Mitzvah, Bat Mitzvah and Confirmation". jewfaq.org. 2011. Retrieved August 15, 2011. ^ "Bar Barakah Ceremony". StudyMode.com. Goldberg, Harvey E. "Rites of Passage: Jewish Rites". Encyclopedia of Religion. Ed. Lindsay Jones. 2nd ed. Vol. 11. Detroit: Macmillan Reference, 2005. pp. 7818–7824. Gale Virtual Reference Library. Golding, Nora. Bat Mitzvahs in America. Lulu, 2015. ISBN 978-1-312-92108-5. Hilton, Michael. Bar Mitzvah: A History. University of Nebraska Press, 2014. Kaplan, Zvi, and Norma Baumel Joseph. "Bar Mitzvah, Bat Mitzvah". Encyclopaedia Judaica. Ed. Michael Berenbaum and Fred Skolnik. 2nd ed. Vol. 3. Detroit: Macmillan Reference, 2007. pp. 164–167. Gale Virtual Reference Library. Oppenheimer, Mark. Thirteen and a Day: The Bar and Bat Mitzvah across America. New York: Farrar, Straus, and Giroux, 2005. Vinick, Barbara and Shulamit Reinharz. Today I Am a Woman: Stories of Bat Mitzvah around the World. Bloomington, Indiana: Indiana University Press, 2011. ISBN 978-0253356932. My Jewish Learning – What Does Bar Mitzvah Mean?